Ad Council PSAs don't get much better than this one from Campbell Ewald and Tool director Sean Ehringer. It would spoil things to reveal what's going on, so just watch. 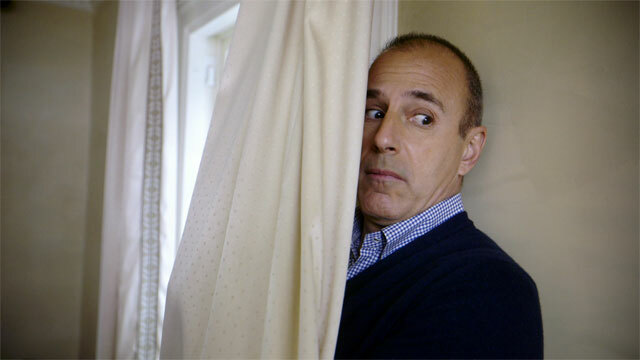 Matt Lauer is pretty great in this mischievous role, part of a weeklong series in which the Today anchors are all engaging with social issues that are important to them. Over a span of two weeks, we generated at least 40 different ideas, from Matt re-creating the Red Bull space jump ("too dangerous") to Matt appearing on air after his kids accidently drew on his face with permanent marker ("too permanent"). One of my favorites had Matt interviewing former President Clinton when Matt's daughter calls and needs help with her homework. She wants to know the capital of Kyrgyzstan. Matt doesn't know. President Clinton doesn't know. They decide to call Hillary. The answer, of course, is Bishkek. The winning idea was based on one of the very first games we play with our kids: Hide-and-Seek. The idea called for Matt to demonstrate his hiding ability in a series of scenes that go from one extreme to another. We shot the commercial in a beautiful old home in Montclair, N.J. It was perfect for what we needed. Lots of rooms. Lots of places to hide. We crammed Matt underneath a sink. Buried him under a load of laundry. Sandwiched him between sofa cushions. Wedged his head between stuffed animals. Squeezed him behind a painting. Covered him behind a curtain. Stuck him inside a chimney. And finally, we submersed him underwater, Rambo-style. The only difference being he was in a tub filled with bubble bath and he was wearing a mask and snorkel. Still, you have to give the guy credit. I don't know how he is at seeking, but the man can hide like a boss. The only thing he refused to do was hide underneath a large area rug. In all honesty, I wouldn't have gotten under that thing either. Now, I've got about 25 pounds on Matt, but he's wiry and he gave me a look that said, "If you try and put me under that rug, we're going to tangle." I guarantee you the next time NBC does "Where in the World Is Matt Lauer?" he won't be under a rug.